Dive Journal: At 1:30PM, it's time to dive again. This time, we take the dive boat to Carl's Hill, a site adjacent to our previous dive at Ebo's Special off Klein Bonaire. The relatively steep underwater wall here and abundance of sea life makes this a great dive. We see lots of juvenile smooth trunkfish, beautiful pairs of four-eye butterflyfish, and scores of cleaning shrimp. 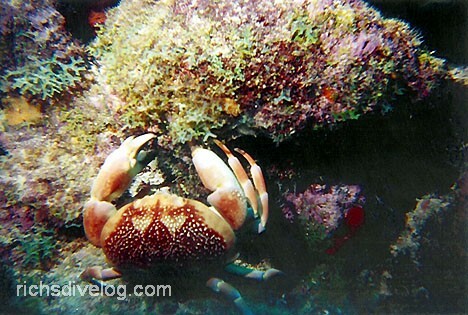 Myron catches sight of a coral crab and takes a photograph of it. Back at the Habitat, we decide it's high time to do some substantial grocery shopping. Piling into the minivan, we head into downtown Kralendijk to Cultimara Market. We find many interesting Dutch products there, some American fare, and a noticeable lack of decent produce. The prices are high, but not out of range. We gather up a few staples, some vegetables, a six pack of Amstel beer. I add on a few strange European beers sold as singles. Myron scores at the bakery with several delectable sweets, but fails to find any ice cream. While exploring through the freezer section, Linda spies a roundish-looking package that she swears is labeled as "Schnottballs" - hmmmm.